Attendance confirmed by Raimundo Amador, Jorge Pardo, Antonio Carmona, Juan Carmona y El Bola. 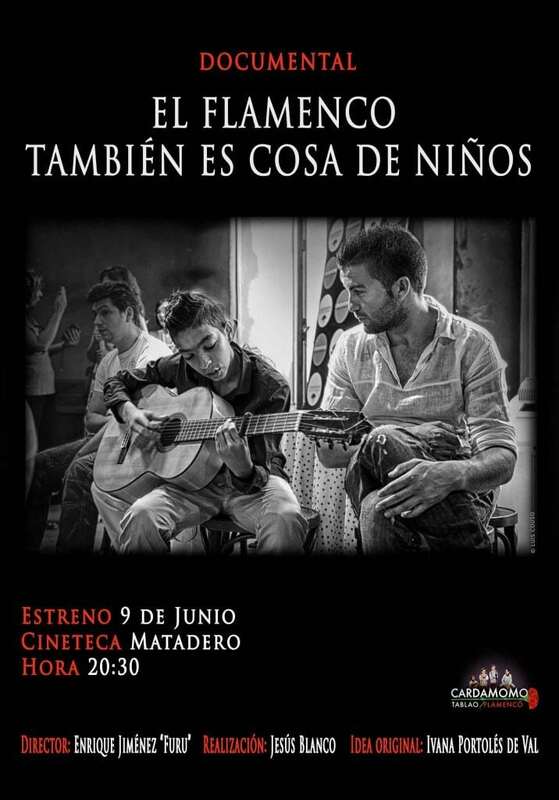 The documentary El Flamenco también es cosa de niños (Flamenco is also for kids) will have one single showing on Tuesday, June 9th, at 8:30 PM in the Sala Azcona Cineteca of Madrid, theatre as part of the cultural event Flamenco and Film 2015. The audiovisual production as an original idea by Ivana Portolés – chief executive at Cardamomo- that has been directed by Enrique Jiménez Furu alongside Jesús Blanco. Boys and girls, ages 2 to 16, are the main characters of this unique documentary that is shown to such a great audience. Their new artistic talent is the natural expression of a deeply rooted feeling of what flamenco is, but also, the successful outcome of commitment in a learning experience that is guided by masters who transmit this art form throughout the generations. During an hour, the documentary summarizes the shared experience of four encounters between great artists and audiences of all ages at Tablao Flamenco Cardamomo in Madrid. The presentation of this documentary is part of an educational immersion program, that was launched in 2013 by Director Ivana Portolés, with the purpose of having flamenco taught in schools as it is an art form that is considered Intangible Cultural Heritage by UNESCO. The release will be attended by many family members of the artists who generously collaborated in the film. Uo until now, those who have confirmed their attendance are the following: Jorge Pardo, Raimundo Amador, Antonio Carmona, Juan Carmona, El Negri, Montoyita, Camarón de Pitita, Moritos, Rafitas, Botes, Saúl Quirós, Carlos Quirós, Juan Tomás, Miguel El Rubio, Los Bolas, Isaac de los Reyes, Abraham Motos, Jony Jiménez, Ángel Jiménez, Alejandro Escribano, Juan Grande, Rana, reporter Eva Armenteros and actor Nicolás Dueñas. Flamenco is also for kids is an original idea by Ivana Portolés, director at Tablao Flamenco ‘Cardamomo’ in Madrid.